This section of the web-site is about the further consequential modelling of by-products and wastes, i.e. those intermediate outputs that are not determining products. The term waste has many specific meanings in different legislative contexts, so to limit ourselves to the physical modelling, we try to avoid using the term “waste” as such. The consequential modelling does not distinguish between by-products and wastes, but treat all intermediate outputs that are not determining products according to the same rules and procedures. A general procedure for all by-products and wastes is that they are modelled as negative inputs instead of as positive outputs. In this way, the determining product becomes the only remaining intermediate output, which is the way that consequential modelling avoids the need for co-product allocation while maintaining the mass and energy balances of the co-producing activity. The ISO 14044 standard calls this procedure for system expansion, since the further fate of the by-products and wastes and the resulting changes (substitutions) are included as part of the product system, as opposed to being cut-off by allocation. Since the term “system expansion” implies that the original product system was incomplete, the more neutral term “substitution method” is often used as a synonym for system expansion. Figure: Two representations of the same reality: In the top one, the by-product/wastes are outputs with positive mass flows. 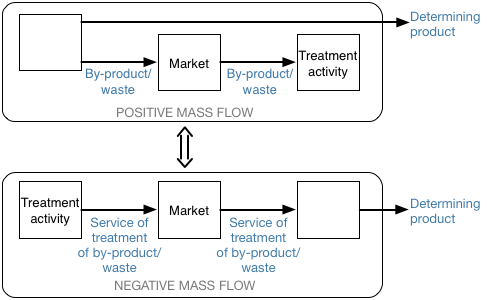 In the bottom part of the figure, the products are instead represented as provision of a “treatment service”, namely the service of removing the by-product/waste, and thus the mass flow is negative (opposite of the direction of the service). Both representations maintain correct mass balances of all unit processes. This logical is also valid for other physical properties than mass, e.g. for energy by-products. By-products and wastes have markets that determine the consequences of a change in their demand and supply. But the nature of the by-product or waste is important for how these markets are to be modelled. in a recycling activity, i.e. a treatment that turns the material into a product that can substitute a determining product. By-product/wastes that are not “materials for treatment” can substitute a determining product as an input to an activity, and therefore can be directly linked to a demand-driven market without prior treatment. The link to the market from the negative input represents a reduction in demand on the market in parallel to the way a link from a positive input represents an increase in demand. Reducing the market demand likewise reduces the required input to the market and all upstream activities. These activities are thus displaced or “avoided”. A by-product/waste can never be the marginal supply to a demand-driven market that has other unconstrained suppliers, because the supply of the by-product/waste is constrained by the demand for the determining product of the supplying activity. An additional (marginal) demand on these markets can therefore not be met by an increased supply of the by-products/wastes, but will instead be met by the unconstrained suppliers to the markets. The markets for materials for treatment have the same function as other markets, but they operate on negative reference products, i.e. on the services of treating or disposing of the material for treatment. They are not driven by the demand for the material, but by its supply, or rather by the need for treatment of this supply. The flow of material is opposite to the flow of the service. The determining products of the treatment activities and the treatment markets can therefore also be expressed in terms of negative amounts of the materials for treatment, i.e. the service of removing the specific amounts of material. The determining product of a recycling activity is thus the service of removing the material for treatment (possibly expressed as a negative amount of the materials for treatment), i.e. the amount of material for treatment provides a constraint on the volume of the recycling activity. The output after recycling is then a by-product of the treatment activity. As for all other by-products, this recycled output is modeled as a negative input of the recycling activity and linked as a negative flow to the market for this output, representing a reduction in demand. An additional (marginal) demand on this market can therefore not be met by an increased supply of the recycled output, but will instead be met by the unconstrained suppliers to this market. An exception occurs when an activity is dependent on the input of a by-product/waste, i.e. when it cannot operate with a substitute for this material, without this input being a constraint on the activity. An example is an activity that produces products that are labelled as based on a specified percentage of recycled material. Such an activity is called a “speciality production” and has a positive determining product (not the service of removing the material for treatment). An additional (marginal) demand from the speciality production will indeed lead to an increase in supply of the by-product/waste to the speciality production, but this amount will come from a reduction in supply to the marginal treatment activities for this by-product/waste (which may well be recycling activities). If there is not enough demand for a recycled material, the material for treatment is not fully utilised for recycling, and the recycling activity is not the marginal treatment activity for this material. Such a material for treatment can also be characterised as being a “near-waste”, since an additional (marginal) supply of the material for treatment will go to disposal (waste treatment). An additional demand for the recycled material will displace the disposal. The marginal supplier of the material for treatment can thus be said to be “avoided disposal”. 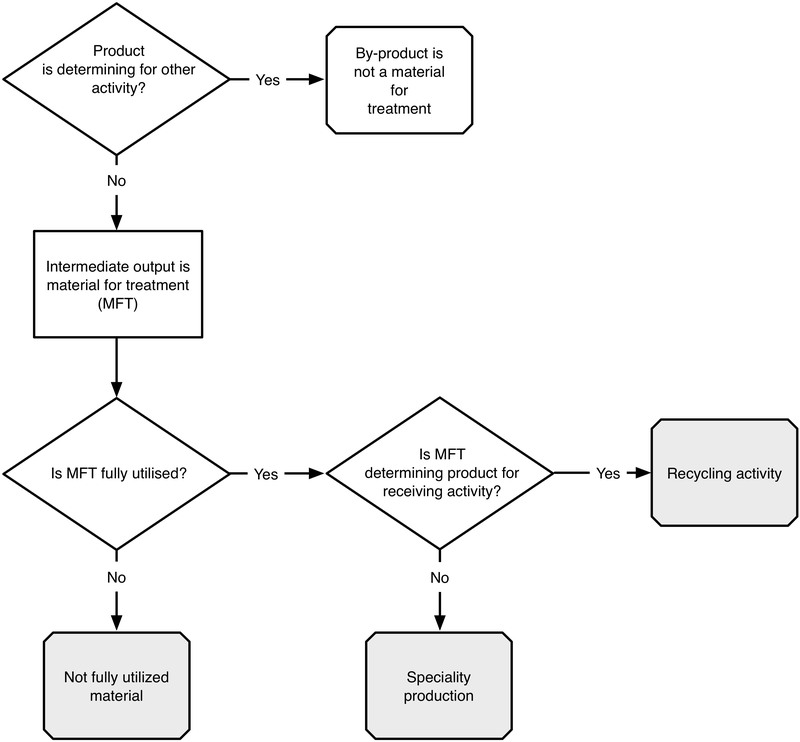 Figure: Decision tree to identify a material for treatment (MFT) and distinguish between the various situations of waste treatment and recycling. Identifying materials for treatment How to identify whether a by-product/waste is a material for treatment. Recycling activities How to model recycling in consequential LCA - looking at by-products that can substitute a reference product as an input to an activity. Not fully utilised by-product When lack of demand leads to a not fully utilised by-product, this implies that any additional amount produced has to go to final disposal and the waste treatment becomes the marginal application. Speciality productions Identifying and modelling speciality productions, which are dependent on a material for treatment as an input, but which are not treatment activities. How to cite this: Consequential-LCA (2015). By-products, recycling and waste. Last updated: 2015-12-08. www.consequential-lca.org.